Phase 1 of New Engineering Facility is Completed. Sycamore Process Engineering Ltd have now transferred all engineering, manufacturing and administration operations into new premises at Sparkford in Somerset. Although the new facility is only 1/4 mile from the previous one which has been home for the last 13 years, with ownership of the new site and buildings, Sycamore can dictate the development of the future phases to suit our customers' requirements. This new facility was considered a fundamental part in the future development of Sycamore. 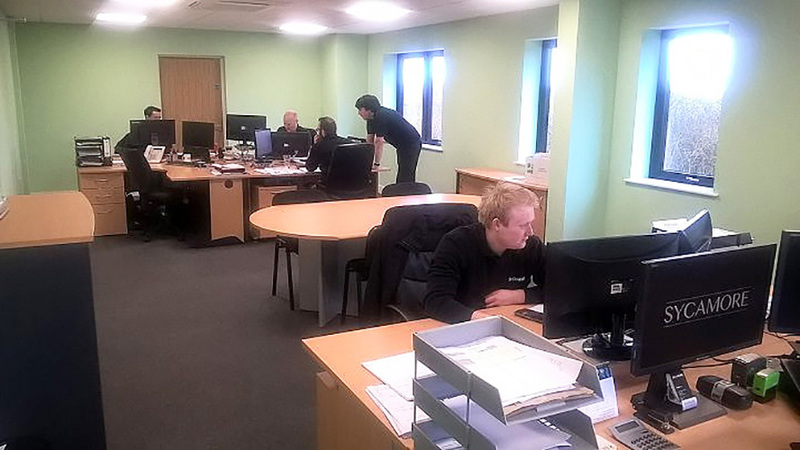 With record contracts won over the past year, the need to have room to expand operations was vital to be able to offer customers peace of mind that Sycamore has the capability to grow along with them. Phase 1 provides a fabrication workshop in which high quality stainless steel vessels, tanks, pump sets, CIP skids and more are manufactured, with a viewing balcony for customers to witness factory acceptance tests. The offices contain all the space required for the back room operations you would expect, but also access to blue chip quality head office facilities with meeting rooms and break out areas for customers and visitors to maintain their corporate contact. Managing Director Tim Sharp says, “this is still very much a work in progress situation”, with Phase 2 planned to double the fabrication footprint with a 10 metre high workshop, this will allow the fabrication of larger vessels and process skids. The new facility incorporates a large dedicated project office where all project operations, management and processes are coordinated. This close working ensures that all project engineers and managers can share information and build a fantastic team spirit.